If I am ever having a bad day, there's nothing that makes me happier than sitting down to do my makeup. What makes this fun, calming, and creative time even better? My Luxie Beauty brushes. 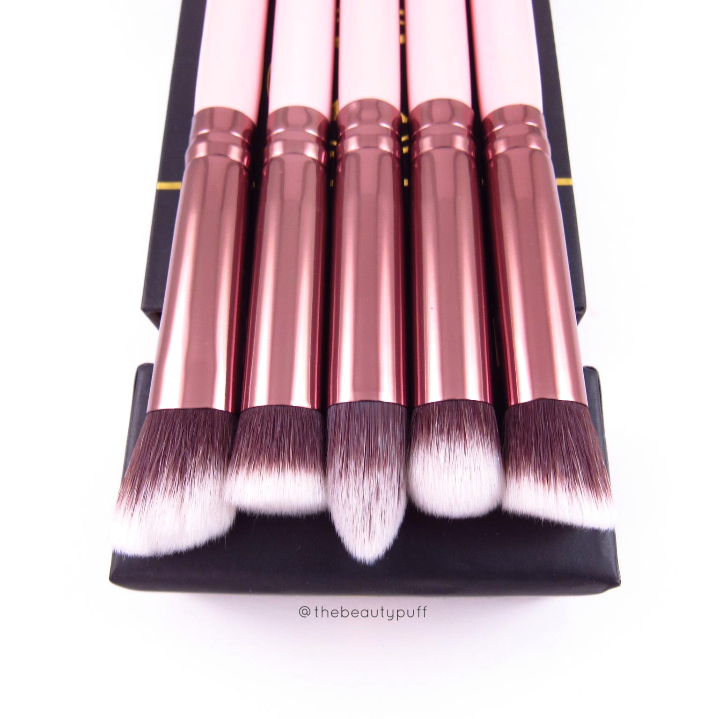 These brushes are pink, rose gold, cruelty free, vegan and oh so soft. What's not to love? My Luxie collection first began when I got a blending brush in an Ipsy bag. If not for this first introduction, my love for Luxie brushes might not be what it is today. Today we will look at my most recent loves, the 5 Piece Detail Makeup Brush Set. Now I know what you might be thinking... five brushes just for concealer? I can't tell you how many times I have been doing my makeup and found these versatile cuts and shapes useful during my morning routine. Let's take a closer look at the differences between these brushes. I have to say of all these brushes I have found myself reaching for this brush the most. 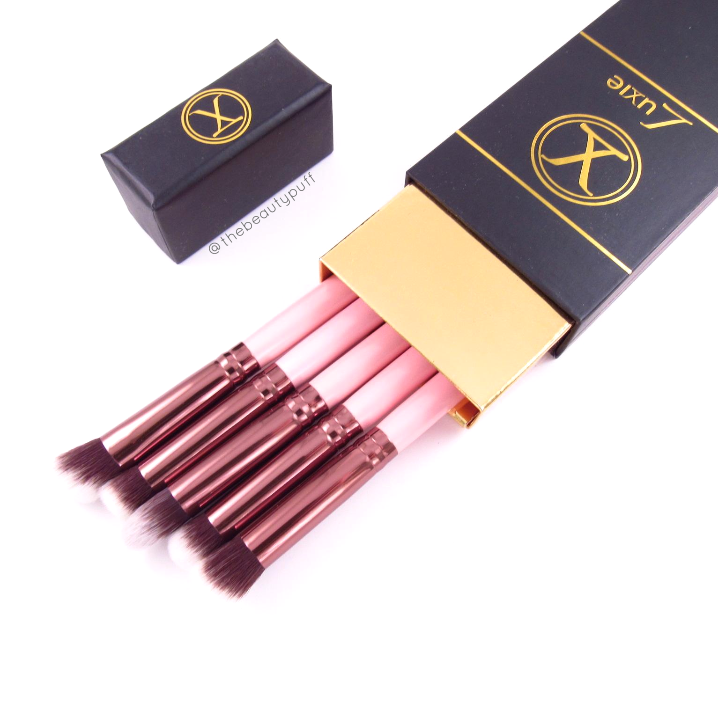 Its soft, angled cut makes it ideal for blending under the eyes gently and efficiently. It is the largest of the brushes so if you have larger areas to blend, this would be a go-to. I find myself constantly cleaning this brush because it gets so much use. One of the things I love about Luxie Brushes is that they maintain their softness after multiple washes! This dense, flat brush is ideal for targeted spot concealing. It is not so dense that it doesn't blend product well, but it keeps it in a concentrated area until you are ready to blend. I use this brush mostly with a stippling motion so I do not wipe product away from the targeted area. I love this brush for my crayon concealer in particular because it sets rather quickly. This brush effortlessly applies the product evenly while maintaining excellent coverage. This is such a unique brush, so I was excited to see this cut included! It easily reaches small areas such as around my nose and the inner corner of my eyes, concealing redness and dark areas. Even after I've done my eye makeup, if I notice I need additional concealing or blending, this is the only brush that can blend without disturbing the rest of my makeup! What a life saver. I consider this brush to be a miniature buffing brush. Its soft, round cut lends itself well to multiple products and formulas. Whether I am using a cream or liquid concealer, this brush can blend a small or large area to perfection. I use this brush in a buffing motion as well as stippling, depending on what I am concealing. It easily glides over the skin with gentle sweeping motions. This brush can also be used for contouring products, whether they are cream or powder. This brush a nice balance between the Tapered Blender and the Flat Blender. It can reach small areas like around my nose, but can also be used for spot concealing due to its dense cut. It's a very comfortable brush to use. If any of the other brushes are particularly dirty, I know this multi-tasker has it covered! Overall, I love the versatility of this set. I don't often go for concealer brushes because they are either too large or just flat, making blending very difficult. This set is a great balance of efficiency, softness and precision. What I also love, is that Luxie's brushes have an antibacterial coating so your brushes stay fresh as long as possible. These will definitely be lasting a long time! Check out the entire line Luxie Beauty has to offer! Also, be sure to follow @luxiebeauty on Instagram to see what deals are coming up for the 21 Days of Giving!